NUTRITION SIMPLIFIED: Science is complicated, nutrition doesn’t have to be, which is why we packed everything you need to feel good and thrive into one simple scoop. A TASTE YOU’LL CRAVE: We know it can be hard to believe something this healthy tastes so good. If you don’t love it, it’s on us. 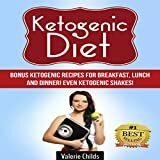 BREAKFAST MADE EASY: Intentionally low carb and nutrient-dense to provide a natural boost of energy and keep you in ketosis to kickstart your day. REACH YOUR GOALS: The Essentials Shake makes it easier than every to stay on track with your health & fitness goals while reaching your ideal bodyweight. ALIGNED WITH YOUR LIFESTYLE: It all starts with the best plant-based ingredients. Our shakes are dairy, gluten & soy free, vegan, keto, and paleo friendly, and are made using the highest quality natural & organic whole foods that you can recognize and trust. Creating the most nutritious shake on the planet was tough, making it taste amazing…nearly impossible, but we did it. Bring your life into balance and “Live Your Fullest Everyday” with the support of the Daily Essentials Vegan Meal Replacement Shake. Full of everything you need and nothing you don’t to be at your best and thrive. Plant-Based Nutrition Never Tasted So Good! Unlike other plant-based shakes, which can be gritty and lacking flavor, the Daily Essentials Shake has a smooth and delicious consistency without all the added sugar. It is from the earth without tasting like dirt. Your taste buds will thank you! LYFE is All Natural, it has No Preservatives, No Artificial Colors, and No Artificial Flavors. An all-in-one nutritional solution for all-day energy. 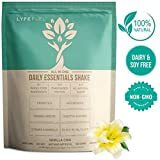 The Daily Essentials Shakes combines 8 products in 1 to help you simplify your health routine, fill common nutrient gaps that exist in the diet, and get the most out of life! Save time and money and add convenience by making the Daily Essentials Shake part your daily ritual. Use it for breakfast to kick-start your day, as a post-workout drink to accelerate recovery and replenish vital nutrients, or when you’re craving a delicious and filling snack on-the-go. Made from all natural whole food ingredients including 18 grams of powerful plant protein, organic greens, amazing superfoods, rich antioxidants, and essential vitamins & minerals. This unique blend helps to protect and fuel the body on a cellular level to contribute to a healthy metabolism, lean muscle formation, healthy aging, and beauty from within. 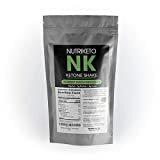 Chlorella, spirulina, cacao, blueberries, raspberries, wheat grass, kale, flaxseed, and grape seed extract are just a few of the dozens of super foods included in this nutrient-dense powder. What separates this shake from the competition? It is hands down the most nutritious & delicious plant-based meal replacement shake on the planet!